Organic, natural, and sustainable. Name it and you have them in one smart and innovative system of urban agriculture. Some say that it could be the answer to food security; others claim that it will revolutionize urban farming to an unprecedented level if its maximum potential capacity is fully tapped. Still others opine that if scaled up and managed sustainably, no person in the city will ever go hungry again. Aquaponics is a smart and integrated system that combines aquaculture and hydroponics. In this technique, farming is blended with fish culture in organic, natural and sustainable way. Aquaponics works based on the principle of symbiosis among plants, nitrogen-fixing bacteria and fish. If you were to think of the classic triple-helix of cooperation that could be found in a natural ecosystem, then this could be one of the best examples. Fish excrete in the water which is channeled up into the plants’ bed. Bacteria break down the fish pooh into nitrates and nitrites, which become the plant’s food. The water that has been naturally cleaned up by this circular process then reverts back to the fish tank. Think of a circular economy in action! This makes the system very efficient – less water is used but more food is produced. It has been claimed that aquaponics beats traditional farming in terms of efficiency, growing crops in half the time. Sustainable and eco-friendly, aquaponics projects support the international community’s goals in three domains: food, water and energy. Food security is a global concern. When scaled up commercially, aquaponics venture can potentially be a food basket in urban as well as in rural areas. In most developing countries where water is considered a precious resource, the enormous potential of aquaponics as a sustainable food source can be life-changing. Aquaponics’ operation is undeniably earth-friendly. Since water is recycled in circular manner, it only leaves negligible footprint from the environment. 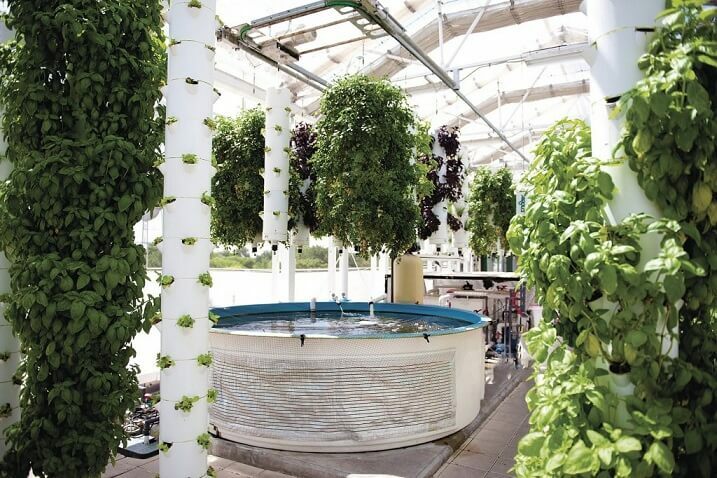 Some aquaponics are run by renewable energy sources such as the sun and the wind; others even tap the law of gravity to make their aquaponics systems work. This enables aquaponics to operate in energy-efficient, sustainable and eco-friendly way. Global hunger and food insecurity are perennial issues that confront human societies. The State of Food Security and Nutrition in the World 2017 Report of the Food and Agriculture Organization revealed that starvation affects around 815 million people – 11% of the world’s population. It has been projected that more than half of the world’s population will live in cities in a few years, making it more imperative to improve the conditions of life of the urban poor. With aquaponics, one can grow veggies and fish all year round. With adequate support from both the public and private sectors, aquaponics can help fix the food system not only in cities but also in rural communities. Sweet Water Organics in Milwaukee, Wisconsin, USA, produce as much as 10,000 pounds of fish in 10,000 gallon tanks and 2,000 pounds of leafy greens. It has been claimed that 25 square feet of plant bed can sustain one person for life.